2. Using an electric food processor make a coarse oatmeal from your oats (should take 5-10 seconds). Add the walnuts and process a bit more. Transfer the mix into a bowl and combine with all other dry ingredients. 3. Warm up the coconut oil, it needs to be soft for the best result. Add the coconut oil to the mixture and incorporate it using the tips of your fingers as if you were making a crumble . The mix will only remotely resemble a crumble but the technique is the same. 4. For the crunchy version: Add coconut milk. For the soft version: Add apple to the muesli. 5. Again using your hands make a consistently thick mixture. 6. Spray a silicon form with coconut oil and press the dough at the bottom. To make an even layer repeatedly dip a tablespoon in a water and glide on the surface until it is even. 7. Bake the muesli cake at 175C for 20 minutes. Take it out and let it cool for 10-15 minutes. 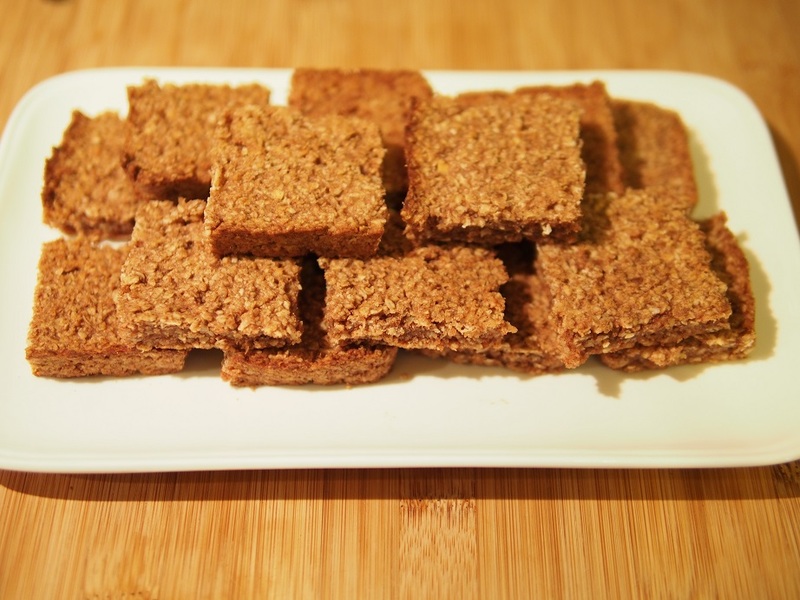 Turn the form over on a chopping board and cut the muesli cake into 16 small square biscuits.